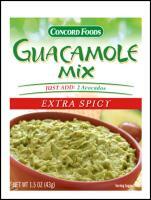 Add 2 ripe avocados to each 1.5oz package of Guacamole Mix to make fresh, homemade Guacamole. Serve guacamole with tortilla chips or use in your favorite recipe. Each package makes 2 cups of Guacamole Mix.